Surely somewhere out there, there are fans of the first two Harry Potter movies who were bereft when Chris Columbus didn’t go on to direct subsequent entries in the franchise. Those few jilted fans can now line up for their methadone in the form of Percy Jackson & The Olympians: The Lightning Thief, a kids’-book adaptation that follows the J.K. Rowling formula closely enough to ease the pangs of forlorn Harry Potter fans in general. There’s the Chosen One kid with school problems and a sad home life who learns that his parentage lends him magical powers far beyond those of his better-schooled peers. There’s his hapless and sometimes helpful boon companion, and their super-smart, prickly girl ally. There’s the special school (in this case, a camp) where they go to hone their special powers. There’s the giant threat that has all the adults stymied, which sends the Chosen One and his best buds on a quest to save the day. And in Columbus’ hands, it once again all breaks down into a series of rushed, breathless special-effects setpieces, in a thrill ride that isn’t headed anywhere new. As kid adventures go, The Lightning Thief isn’t awful; if nothing else, it (and the Rick Riordan book it dumbs down and slicks up) might serve as a gateway into further reading in Greek mythology. Protagonist/Chosen One Percy Jackson (Logan Lerman) is the son of Poseidon, and just one of a huge wave of new demigods spawned by randy Greek gods and left to make their own way on Earth, in part under the tutelage of a weary-looking Pierce Brosnan as Chiron the centaur. 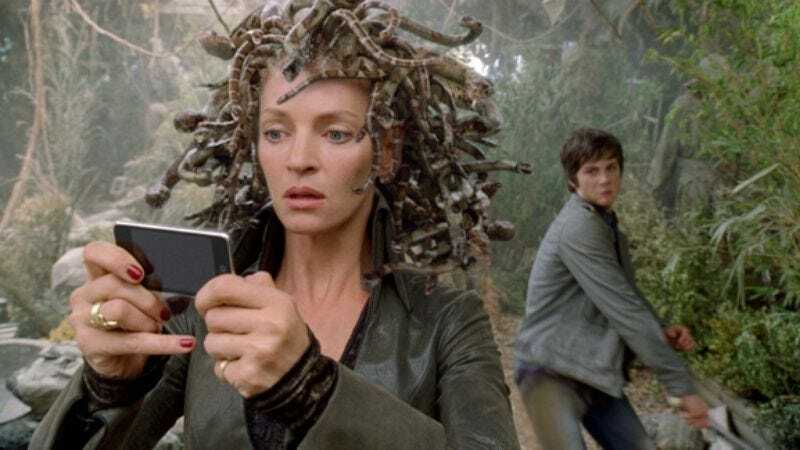 Percy’s quest to return lightning to Zeus (Sean Bean) leads him and his friends into conflict with the likes of a hydra, Medusa (Uma Thurman), and Hades and Persephone (Steve Coogan and Rosario Dawson). The modern-day updates of these old myths are minor and not particularly imaginative—Coogan plays Hades as a strutting Alice Cooper type, while Percy uses the reflective surface of an iPhone as a mirror to avoid looking Medusa in the eye—but at least Riordan’s books have a rich background to serve as source material for the story’s chases and swordfights. That said, Columbus’ adaptation is obvious and clumsy, with the characters dutifully overexplaining every thought and emotion, and the soundtrack choices making weak jokes that aren’t worth the effort. (Did someone just mention the highway to hell? Cue “Highway To Hell”! Characters going to Vegas? Time for “Poker Face”!) The effects are impressive, but they stream by with only momentary impact, given how common this kind of spectacle has become. Like The Spiderwick Chronicles, Bridge To Terabithia, City Of Ember, and other recent CGI-heavy kid-lit film adaptations, Percy Jackson is mostly a reasonable distraction for bored kids, but also a reminder that the source material is almost always more flavorful and fulfilling than derivative work.